– Microwave safe, fridge & freezer safe. – Fashionable design and unique color. – Compact size makes it convenient to take meals on the go! – Durable 304 stainless steel and non-Toxic free food grade silicone. – Includes 2 tiers, place your food separate,no smell pollution exists among the independent chambers. When you receive our Lunch Box, if you are not satisfied,within 30 days, for any issue or concerns, you can contact us directly and ask a return or full refund. We wouldn’t let you suffer any loss! Don’t wait to order the best insulated lunch box on the market today! Click “Add to Cart” now to have your brand new insulated food container rushed to your door! 100% Premium Food Grade Materials – This Lunch Box Can Keep Food Warm for 6 Hours. 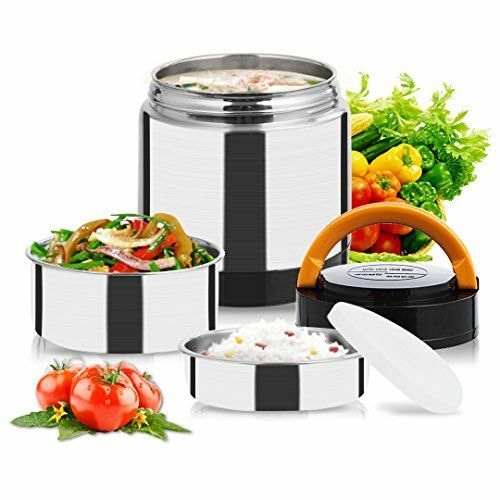 Made up high quality and no magnetic 304 stainless steel inner, naturally BPA-free; Using seal structure, will not sprinkled, will not leak. The applicable temperature from -20℃ to 100℃, no addition concern needed. Perfect for school & office, kids & adults. Help your family eat well with balanced healthy food options. Keep Your Food Fresh At Optimal Temperature – 1.4 L thermos food jar features a robust, top grade stainless steel interior and exterior for superior temperature control and durability over time. The double walled vacuum design makes sure that your food stays warm at 60ºC for up to 6 hours. Food Container Size – (Diameter) 5.1 x (Height) 6.5-Inches; Capacity: 47.8oz(1.4L). Double vacuum inner design allows you to separate your food.It can also be used as one layer or two layers.The top tier features a vacuum seal to prevent spills, a comfortable handle to better carrying. Make Best Use Of Food – Take some of that wonderful food from morning with you today. Placing it horizontally, then just simple opens it for lunch. Saves you money and time while giving you and your family better nutrition. NOTE: The heat insulation effect may be influenced by the food temperature and room temperature. And preheating it with hot water for 2 minutes before every-time using can make a better vacuum result. Buy with 100% Confidence – We are so confident in the quality of our food stackable jars that they are guaranteed for life against any breakages or manufacturing defects; if it ever breaks, we will resend or give you the full refund. If you have any questions, please leave your messages, we promise to reply you within 12 hours and offer you best services. FINALLY A REAL THERMO!! i DID 3 or 4 test with different foods. They all passed the test. The food stayed warm or hot in some cases. This is real Thermo and most important does lie!!! It keeps food hot !!! !